The defects of the nails (changes color, streaks, thickening …) should not be underestimated, as this small part of the feet can relieve many disorders whose symptoms, precisely, can manifest in the nails. Its can appear on the nails of one or both feet. Let’s see what problems we alert the appearance of nails and which are most effective remedies to stay healthy. How to cut nails: often and accurately, short, square shaped, and being careful with the ends. Wash your feet often, drying well, without forgetting the spaces between the toes. The humidity is fertile ground for the growth of fungi. Carefully choose socks and shoes, best opting for those who help the correct position and foot perspiration. 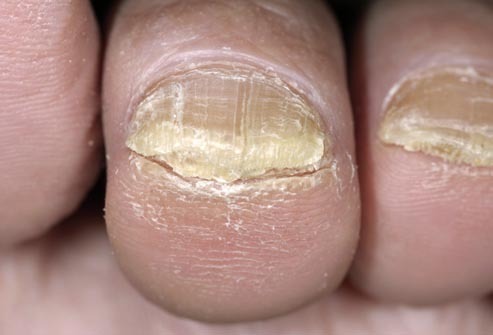 When the cause is a fungus that causes nail infection are facing onychomycosis, which may affect one or more toenails. The most common signs are fading nails, between opaque and yellowish. In some cases become thicker than normal, but it can also become very fragile and break easily. To solve the problem the best way is to use creams and specific ointments that are applied at the local level. The doctors can also oral antifungal prescription, to counter the infection and eradicate the fungus. The most common abnormality of the toenails is the discoloration. Specifically, if the nail surface appears white spots may be due to air bubbles that are formed between the plates, creating a microtrauma to the nail matrix, or it could be a symptom of a skin disorder (psoriasis, atopic dermatitis). If the color is yellow, the cause can often be attributed to the use nail polish or other products of lower quality than desired for the pedicure. It can also be a sign of a disorder that affects the respiratory system. In this case, the yellow discoloration affects both toenails and hands. Purple nails can be a symptom of cardiovascular problems related to poor tissue oxygenation. In this case, you should always consult a doctor to diagnose the exact cause of the problem. Parallel ridges that cross the nail may be the result of physiological aging of the organism and tissue, but can also be a symptom of a chronic eczema. In other cases, may simply be a lesion by a too aggressive pedicure that has gradually eroded the nail matrix. The abnormal thickening of fat toenail (Onychogryphosis) can be caused by aging or by the use of inappropriate footwear, too tight or too uncomfortable. In some cases, it can also be a symptom of thyroid disorders or psoriasis.